The all-day activities pass is a great way to experience all that Snowbird has to offer right now. You can also use your Visit Salt Lake Connect Pass for a ride on the tram. First opened in 1971, Snowbird’s Aerial tram whisks passengers along a 1.6 mile cable and up 2,900 vertical feet during the 10 minute trip to the top of Hidden Peak. Tram riders can look up canyon toward Alta and down into the Salt Lake Valley below while passing over thousands of wildflowers and mountainsides of green. There is no more spectacular vista in the Rockies than the view from atop Hidden Peak. And certainly not one that is so easily accessible! During the ascent your tram operator will offer a short commentary, describing the tram and surrounding points of interest. The round trip can be done in 40 minutes, including about 20 minutes of sightseeing on Hidden Peak, but guests may spend as long on the peak as they wish. Indulge your inner cowboy with Snowbird’s mechanical bull, “Black Jack.” Expert and beginner riders alike will thrill to the experience of saddling up on this 1,200 lb, hydraulic, Black Angus bull. No experience is necessary and operators can dial in any level of bucking intensity from mild to WILD! If you do get tossed off the bull you are sure to land comfortably on the 400 square feet of thick foam padding that makes up the bull ring. Keep in mind, the bull is for ages 7 and older only. Much more! 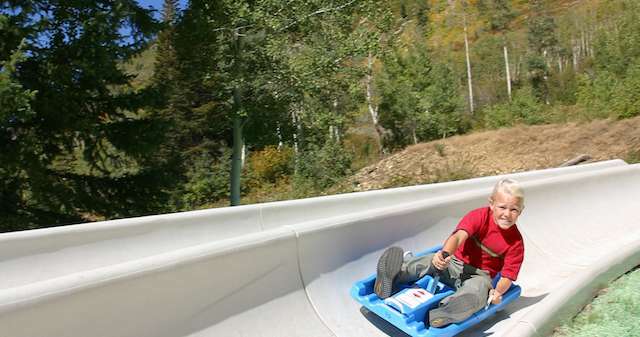 Visit the Snowbird Summer Resort page for more ideas and activities! Read more from Michelle Powell at www.enjoyutah.org. Photo courtesy Visit Salt Lake.